Beginning of "The Anatomy Lesson"
Created in 2001 and depicting a nineteen part anatomical dissection sequence, these paper dolls are finally being developed into a shadow box piece. They were drawn on a lithography stone at the University of Wisconsin and printed with the help of Lithography Professor and printmaking master, Jack Damer. Some may recognize the dolls from my design of Oneiroid Psychosis' 2001 release, DREAMS (with pollutions when virile). I was never satisfied with half the dolls in the sequence, and so all nineteen sat, tucked into a flat file drawer. In the long version, the paper dolls become more skeletal towards the end of the sequence, and I always felt they weren't projecting the right mood. I'm glad a shortened version of the progression got printed in DREAMS, but I didn't feel confident enough about the end stage dolls to commit to a shadow box. Over the years I took the nineteen out from their drawer and tried different arrangements, different approaches, always feeling there was some potential. Recently I have decided to move ahead and use the first ten dolls in the series. The progression feels strongest when the dolls are their most subtle. 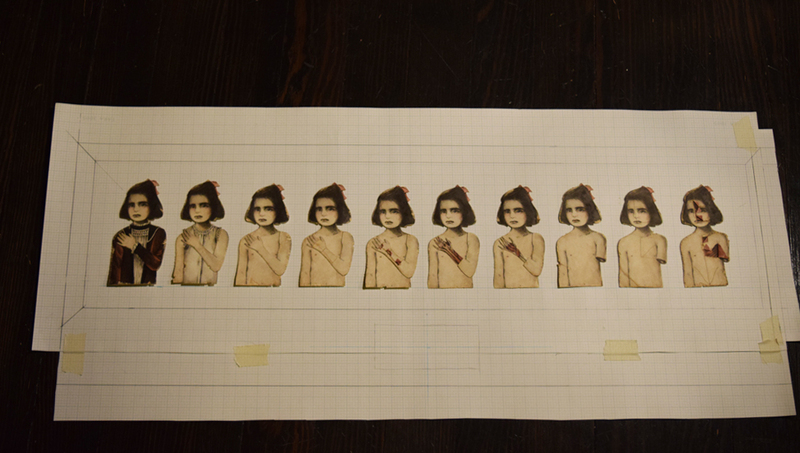 Dolls #11 and #12 will be framed separately, as they work better as individual images. The rest of the dolls...who knows? For now they return to the flat file. The shadow box itself will be of simple design, with a bronze title plate. The piece will be called The Anatomy Lesson and will be finished early 2017. Planning the arrangement and construction of The Anatomy Lesson. 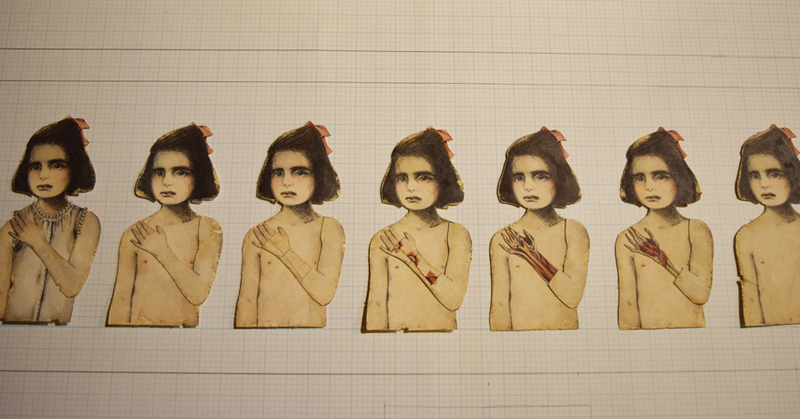 Detail of some of the lithographic paper dolls in The Anatomy Lesson.